Was born February 18, 1845, in Hillsville, Lawrence county, and is a son of Silas STEVENSON, of New Castle, ex-sheriff of Lawrence county. He graduated at the Cleveland, Ohio, Medical College in March, 1868, and located a short time afterward in New Bedford, where he has been engaged in the practice of medicine ever since. The doctor owns and manages the only drug store in the place in which he resides. He was married June 12, 1870, to Miss Sarah E. ROBINSON, then of Union township Lawrence county. The doctor was a member of Company K, 100th Regiment P.V. During his connection with the regiment he was twice wounded in battle. In the fall of 1884 he was elected to the House of [p. 129] Representatives by the people of Lawrence county. He then received the highest vote ever cast in Lawrence county for a candidate for Assembly. During his first term in the Legislature he was a member of the following committees: Educational, Judiciary, Local Library and Accounts, and was present at nearly every meeting of each committee. In the fall of 1886 he was re-elected by a large majority. He has thus served the people of this county two consecutive terms in the Legislature, with credit to himself and honor to the county. He was highly commended by the press of Harrisburg for his attention to the business which came before the house. In New Bedford, where he resides, the doctor is well thought of. He is a member of the Disciple church of New Castle, but is a regular attendant of the United Presbyterian church of New Bedford. Hon. Silas Stevenson, M.D., a leading physician of Ellwood City and formerly a member of the Pennsylvania State Legislature, was born February 18, 1845, in Lawrence County, Pennsylvania, and is a son of Silas and Sarah (Cracraft) Stevenson. Dr. Stevenson comes of Revolutionary stock and of Scotch-Irish ancestry. His paternal grandfather, James Stevenson, served in the Revolutionary War. He married Nancy Moore of Lowellville, Ohio. The maternal grandparents, John and Mary (Hill) Cracraft were pioneers in Poland, Ohio, where he became a merchant. The Cracrafts were Scotch. Silas Stevenson, father of Dr. Stevenson, was born in 1808, at Mt. Nebo, Mahoning County, Ohio, from which place he moved to Lawrence County when it was yet Mercer County. He became a man of substance and political prominence and in 1858 he was elected sheriff of Lawrence County and served until 1861. He resided in New Castle until his death, which occurred in 1894,, under the weight of eighty-six years. His first wife, the mother of Dr. Stevenson, died in 1854, having been the mother of nine children: James W., who died in Minnesota, in 1856, married a Miss Kent; Joseph C., who formerly engaged in farming, resides with a daughter at Beaver Falls; Nancy Jane and Albert G., both died when aged about ten years; John H., who was born in 1842, served as second lieutenant of the noted "Roundhead Regiment," during the Civil War, later practiced law and engaged in a real estate business at Pittsburg, and died in 1904; Silas; Mary Hannah, who was born in 1847, married John W. Edwards of New Castle, and died in 1866; Martha M. and Samuel B., both died in childhood. Silas Stevenson was married (second) to Eliza Sample, who survives at the age of ninety years. The children of the second union were: Charles Stevenson, who was born in 1857, died in 1859; James A., who was born October 11, 1858, is engaged in a plumbing business in New Castle; William M., who was born in 1860, is a music teacher and resides in Pittsburg; Francis Bacon, who was born in 1863, is a minister in the Presbyterian Church and resides in Minnesota; and Edwin M., who was born in 1865, is engaged in business at New Castle, being a member of the firm of Stevenson Brothers. Dr. Silas Stevenson spent a large part of his boyhood attending school. On his nineteenth birthday he was sworn into the United States service as a member of Company K, One Hundredth Regiment, Pennsylvania Volunteer Infantry, in which he served until the close of the Civil War, seeing a large amount of military danger and hardship. He took part in the following battles which marked 1864 as a memorable year in that great struggle: Wilderness, Spottsylvania Court House, North Ann River, Cold Harbor, Petersburg and Fort Steadman. On July 16, 1864, he was wounded near Petersburg by a sharpshooter, and on March 25, 1865, at Fort Steadman, he was struck on the head by a piece of exploding shell. The first injury confined him to the Chestnut Hill Hospital, Philadelphia, for some time and on May 15, 1865, he was finally discharged from the Satterlee Hospital, in the same city. Following his recovery, in the fall of 1865, he entered the Western Reserve Medical College, at Cleveland, where he was graduated March 4, 1868. 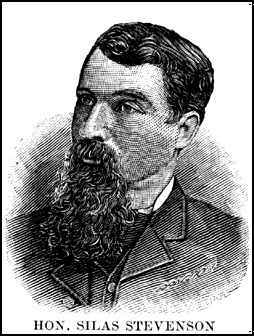 On April 15 following he located at New Bedford, where he engaged in continuous practice until 1891, and during the period covered between 1872 and 1884, he served as postmaster of that place. In 1891 he removed to Ellwood City where he has been a prominent and public-spirited citizen through all these years. In 1884 he was first elected a member of the State Legislature, and in 1886 was re-elected, serving as a most creditable representative from Lawrence County. In 1889 he was made a member of the Pension Board at New Castle and has served as a member of this body ever since, with the exception of the last four years of President Cleveland's administration. Dr. Stevenson was president of the first School Board and of the first council of Ellwood, and for five terms has been a member of the Ellwood Borough council. He has always been active in all matters concerning the welfare of the public, wherever his home has been, and is justly considered one of the most representative citizens of Lawrence County. Dr. Stevenson was married June 7, 1870, to Miss Sarah E. Robison, who was born near Edenburg, Pennsylvania, and is a daughter of Andrew and Mary Robison. Mrs. Stevenson belongs to the United Presbyterian Church.